.......53 Buddhas and Me .................My Life Adventures.....: Do Lists Work? With no real work today and no pressing things to do outside the house, last night I decided to write down my list of challenges I wanted to complete today. My list had 12 items on it ranging from meditating, cutting Shanes hair, sort out some of my jewellery supplies to doing the washing and completing my mosaics. My day started with a calming 30 minutes of guided meditation which got my mind and body ready for the rest of my Tuesday. Usually when I decide to have a day of getting stuff done, somewhere along the way I get sidetracked and end up doing things I didn’t plan on doing and sometimes leave more things that need to be completed than when I started. But today it was different, was it the intention of completing my list or was it starting the day of with meditation or was it both? I am now sitting here feeling pretty good about my day with having finished 11 of my 12 goals and the only reason I didn’t finish the 12th was because it was an internet based goal and the website I needed to go on was down. 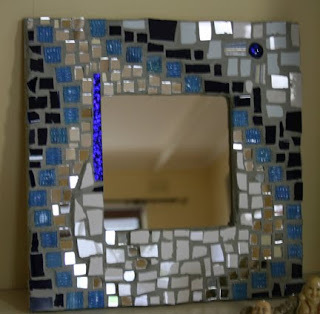 I’m really happy to share my photos of my mosaics, the 1st is my mirror, and I am very pleased with it. The 2nd is a called a gazing ball (I think), it should look a bit shinier tomorrow when I give it it’s final shine. Good you you, Davine! Congrats on getting so much accomplished! 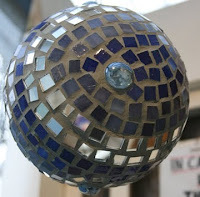 Your mosaics are beautiful and the colors are great! I LOVE that mirror Davine, awesome work! Good for you to complete your list, not your fault the net was down so check that one off! Great job getting everything done on your list! Love the mirror!! !